It was a sad case of deja vu all over again for another fine Maryland team. 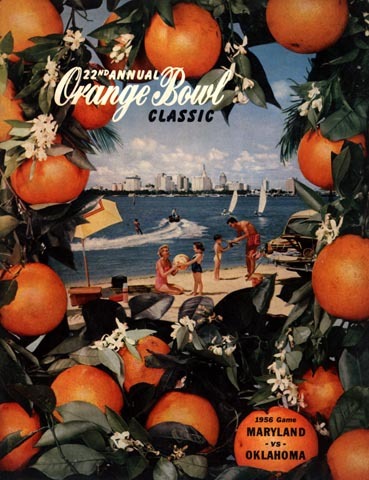 Just two years ago, the # 1 ranked Terps took their act down to Miami for an Orange Bowl date with Bud Wilkinson's Sooners and came out of it with a 7-0 loss. With that in mind, how was a mere unbeaten # 3 team ever going to be a match for an Oklahoma eleven that hadn't lost a game since 1953? And as it turned out, the 21-7 score was deceptively close, as the Terps were never in the game.